'Applegreen', the H.P. 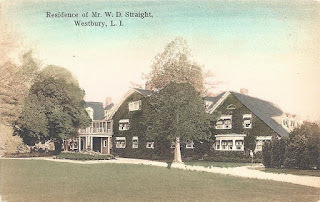 Whitney residence built c. 1902 in Old Westbury and pictured here under the owner of Willard D. Straight. Click HERE for more on 'Applegreen'. At the right side of the house you can see what appears to be a gardener. I hope he had good balance when it came time to climb a ladder & trim all that ivy around the windows & under the eaves.